New evidence has been uncovered for the presence of a jet of high-energy particles blasting out of the Milky Way’s supermassive black hole. As outlined in the press release, astronomers have made the best case yet that such a jet exists by combining X-ray data from NASA’s Chandra X-ray Observatory with radio emission from the NSF’s Very Large Array (VLA). 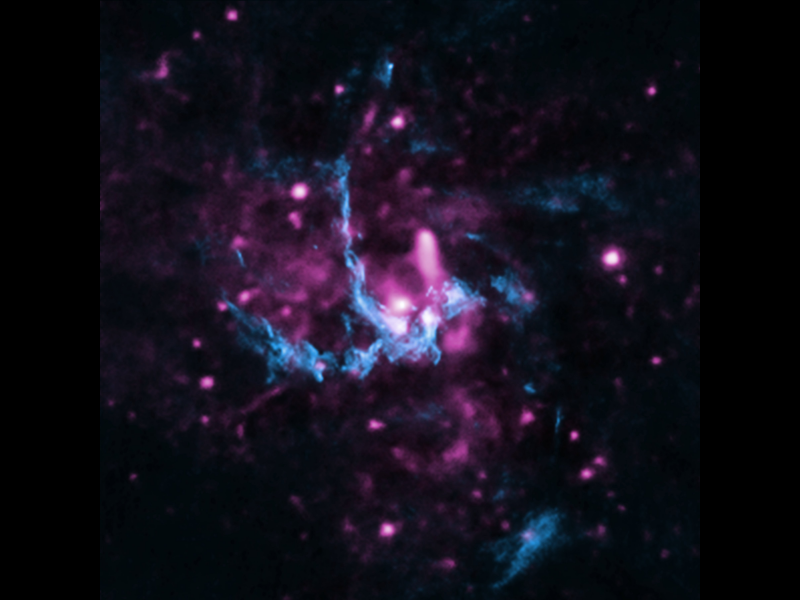 This composite image features both X-rays from Chandra (purple) and radio data from the VLA (blue). In addition, the location of a shock front is also marked. As the jet fires away from Sgr A*, it continues to travels through in space until it hits gas several light years away. (The region around the Milky Way’s black hole has many clumps of gas and dust.) Once the jet hits, it triggers the formation of a shock front. This interaction also further accelerates electrons, that are already moving fast. This generates X-rays as the electrons stream down the path of the jet, past the shock front. The shock front is also of interest because it is unusually wide in the radio emission compared to its more narrow profile of the jet in X-rays. This suggests that there may be a secondary, weaker outflow, which might be like a sheath or cocoon surrounding the jet with an opening angle of around 25 degrees. PreviousHoly Crap! They Hid MARS From Us — Covering Over Whole Cities!